I believe we can redefine ourselves with a scent. Maybe I just take myself too seriously. Maybe I long for variety more than the average woman. But a few weeks ago, I wanted to become someone else -- someone more sophisticated than the baby toting, Barney song singing, bottle preparing, make-up-less Mommy that I am of late. I wanted to feel different. I knew I needed a scent to inspire this virtual transformation. I found it. I found the one that makes me want to paint my lips, tousle my hair, speak a little slower, bare some shoulder skin and bat my eyelashes. I found the one that helps me forget the tedious tasks of the day and instead focus on sensation, emotion, tenderness. I found the one that highlights my wise, determined nature. Finally, I found the one that takes me to dimly lit rooms, crackling fires, velvety rugs and blankets. It is Byredo Accord Oud. Founded by Indian creative Ben Gorham, Byredo is a Stockholm based house that believes in limiting raw materials and focusing on quality of craftsmanship. Accord Oud is one of fourteen in the catalog, along with various high quality candles, soaps and body washes. The scent begins fresh, with notes like clean clary sage and tender blond woods accented by dry leather which initially demands all olfactory attention. As it evolves on the skin, Accord Oud takes on a simultaneously rich, smoky, nutty quality. Juicy blackberry and plum, rich, intoxicating rum with spicy saffron and cinnamon develop as the scent adheres and grounds itself to the skin. Surprisingly, the effect is neither sweet nor wet but rather dry, elegant, meaty, almost edible. Like L’Artisan Traversée du Bosphore’s wise, clean, intellectual mentor, Accord Oud is startlingly refined and exceptionally interesting. In its entirety, Accord Oud resembles nothing I have previously experienced. The oud craze passed me by as too heady and the revival of leather-based scents appeared trendy. 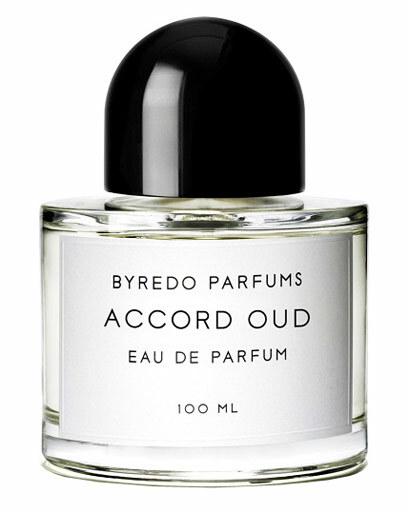 However, I declare Byredo Accord Oud the quiet, sophisticated leather oud – for those who previously dismissed these notes. Here is where the scent redefines me: no flowers. This former opulent white floral lover has embraced a scent that completely lacks blooms. In so doing, I instantly reveal my new identity: grown up sophisticate. (I am definitely taking myself too seriously!) In all sincerity, I am a different woman than I was before bearing children. Byredo Accord Oud’s classy, interesting, unique aura lends an extra edge and elegance to my long, maternal days. Tamara, thank you for this lovely post! I can relate to what you say in so many ways. I love how you describe the way this perfume transforms you, and I am glad you found it. Tamara, you are a stronger woman than I! I have yet to find ANYTHING that makes me want to paint my lips, tousle my hair, speak a little slower, bare some shoulder and bat my lashes. By the time my Mommy day is over, I could bathe in champagne and diamonds and still only want comfy clothes and my bed! Oh my. I must try this. Dears, I apologize ... I did not know this post was up! Tamara, what a lovely review, and I had to laugh at the last part about "no flowers" - same here! I was once all florals, all the time, and now I can appreciate fragrances like this too! How we change and grow with exposures to different fragrances and life in general is just amazing to me. Wow! Excellent article about Perfumes. Love the blog! Thanks for the post! Keep Posting!